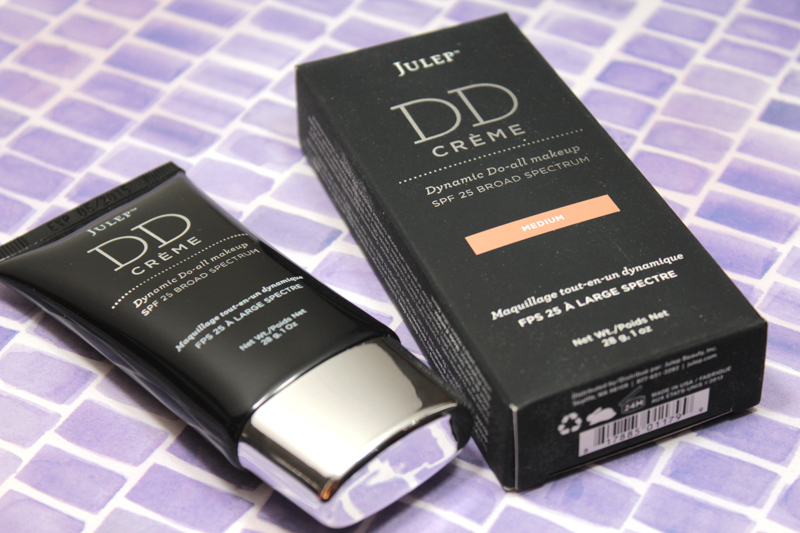 Last month's Julep Maven boxes included their new DD Crème. "DD" standing for dynamic do-all makeup. It is supposed to go beyond BB (and I suppose CC) creams to moisturize, prime, even, and protect the skin. It comes in four shades—light, medium, medium-dark, and dark. If you have very fair skin, I'm not sure that the lightest shade will be light enough. I chose medium (the second lightest shade). 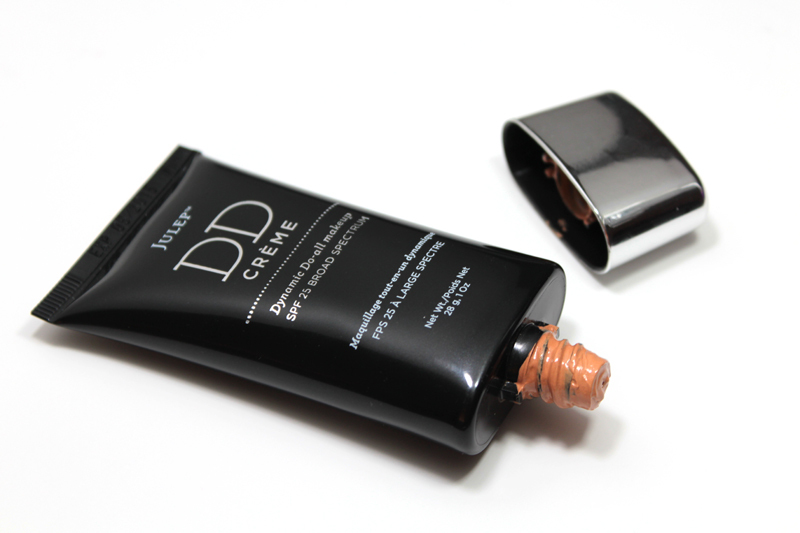 This DD Crème comes in a tube with a twist off lid. When I opened it up, there was product everywhere. All around the nozzle and in the lid. I also noticed that the tube felt empty. I have no idea where it went either because there was no leakage inside the box. Considering there's only an ounce in the tube, a lot of the product was wasted (or is missing). I applied this with a Real Techniques Expert Face brush, although, the formulation is creamy enough to apply with fingers. It went on nicely. There were no streaks or unevenness. It felt like a tinted moisturizer on the skin. I did notice that it clung on to some dry patches I have around my nose, though. Light. It's slightly buildable, but it doesn't offer any real coverage. Also, the colour is slightly orange-toned. Initially when I swatched the product, the orange blended away nicely, but it is definitely noticeable on the face. The colour is a bit dark for me as well. I'm typically in the medium range (especially in the summer), so it's strange that this shade was such a miss. 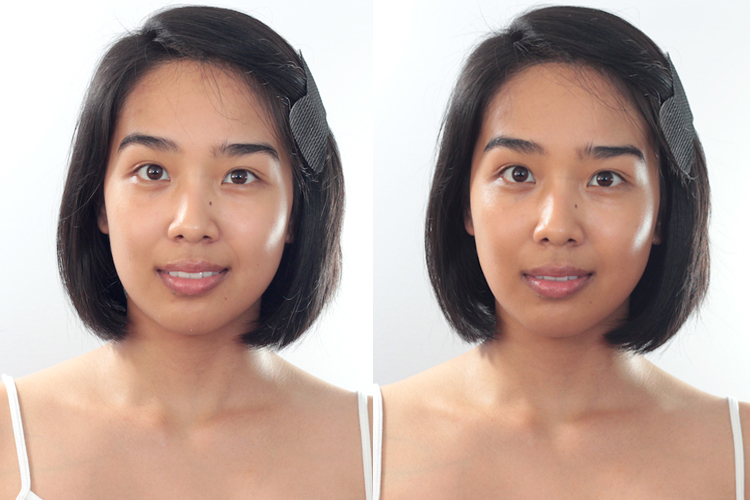 You can see the effect in the before / after photos. It does slightly even my skin tone, but it doesn't do a great job at covering blemishes (nor did I notice a difference in the appearance of my pores / fine lines). After a couple hours of wear, I started to notice it peeling in some areas. I thought it just didn't sit well over the moisturizer I used (which, for those wondering, was a thin layer of Clarins Beauty Flash Balm). I tried it without a moisturizer underneath, and while it did feel hydrating, it still peeled in certain areas. Also, my t-zone was looking particularly shiny around the one hour mark. I would've definitely benefited from an oil control primer, or a setting powder. Currently, it's only available from Julep (or Julep.com). It regularly costs $36.00, while the Maven price is $28.80. I thought this product was ok. Not only was the colour a miss but I wasn't a fan of how it felt on my skin. I wasn't particularly wow-ed and I would not re-purchase it (nor will I likely finish the rest of the product). I think you look much better in the before pic! I'll be skipping on this one! How disappointing! You look great in both pictures, but the peeling is one of my biggest pet peeves of ANY moisturizer or bb/cc cream!